Just when we thought cell phones couldn’t possibly cram in any more functionality, a team of scientists at Simon Fraser Universityâ€™s School of Interactive Arts and Technology (SIAT) have gone and turned two phones into robots. 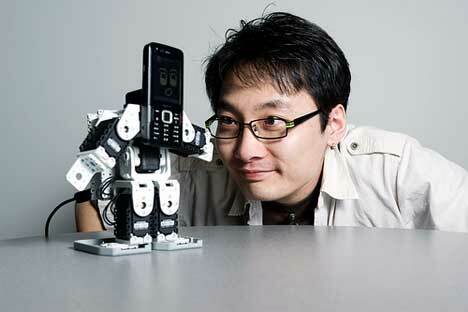 The adorable bots can dance, walk, gesture and display emotion when directed by incoming calls or text messages. Cally and Callo were built by Ji-Dong Yim and Chris Shaw to bring robots into everyone’s daily lives, while helping to personalize the cell phone communication experience. When receiving an incoming call, the bots can dance around or wave their arms to call attention to themselves, even remembering different movements for specific phone numbers. Through the wonders of wireless networking, a user can move one robot and the other will move in a similar fashion, allowing people to add a more physical element to their phone conversations. Callo, the second prototype, is slightly more sophisticated than Cally, the first bot. Callo can turn emoticons received via text message into human-like facial expressions on his screen. He can also respond to urgent messages in an appropriate manner: waving his arms frantically at an urgent message or slumping his arms and “crying” when he receives a sad message. The team isn’t planning to market the robots in their current forms; instead, they are using these (and future) prototypes to explore the social connections between humans and robots. In future generations, helper robots may use this technology to develop a more intimate human/robot bond. See more in Phones & Mobile or under Gadgets. May, 2010.